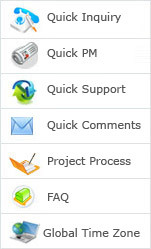 We have a quick response Project Management team. They are efficient, friendly and quick response. Please dial our PM direct line to reach them, to get the latest project progress or assign the new jobs in time. Please dial extension number to reach your PMs. If you are not sure our PMs' extension numbers, please contact them by emails to get the detailed contact information. Please DON'T cc this email for general issues.